Thorgan Hazard has told Borussia Mönchengladbach he wants to leave. 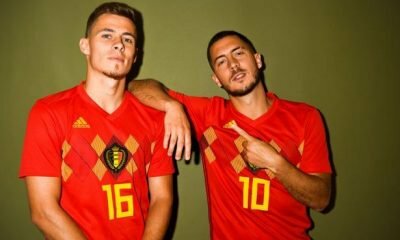 The 26-year-old, who is the younger brother of Chelsea’s Eden Hazard, has been linked with Liverpool, Atletico Madrid and Borussia Dortmund. And the race is on after Hazard told Borussia Mönchengladbach sporting director, Max Eberlm that he wants to quit the Bundesliga club this summer. Eberl told Sky Germany: “Thorgan has informed us that he doesn’t want to extend his contract and that he wants to leave the club in the summer to take the next step. Hazard has scored nine goals in the Bundesliga this season and has provided 11 assists. He joined Gladbach from Chelsea for £7.2m in 2015.